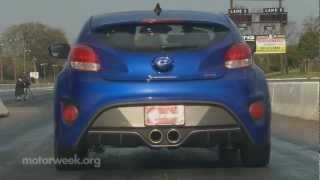 Hyundai Veloster Turbo 2013 powered by 1.6 L Turbo engine with 201 horsepower had a world debut at the Detroit Auto Show earlier this month. 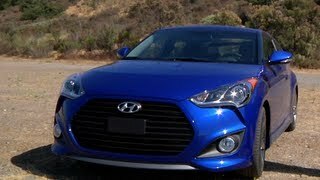 Veloster Turbo is one bookend to Hyundai’s turbocharged sports coupe line-up, paired with the refreshed 274 horsepower, rear-wheel drive, the Hyundai Genesis Coupe 2013. 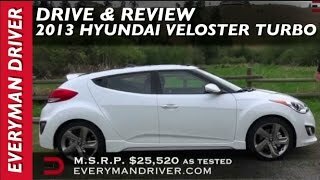 The 2013 Veloster Turbo arrives in the Summer of 2012, facing off against worthy competitors such as the Volkswagen GTI, Honda Civic Si and Mini Cooper/Clubman S with a better power-to-weight ratio than all of them, and a unique sport-tuned steering and suspension hardware set. The Veloster Turbo is mated to a six-speed automatic transmission with steering wheel-mounted paddle-shifter and and Shiftronic® controls rather than the base Veloster’s EcoShift DCT. This is due to the increased torque output from the 1.6-liter Turbocharged-GDI engine. The gear ratio spread on the automatic transmission is slightly narrower than the DCT (6.0 vs. 6.38). A narrower spread maintains the engine in the power band when going from one gear to the other. The base Veloster’s EcoShift DCT is tuned for fuel efficiency and not for the performance feel needed for the Veloster Turbo. 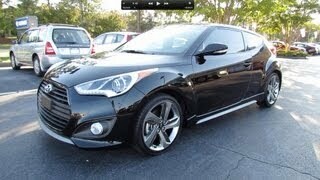 Veloster Turbo’s aggressive personality means it can be dressed in an exclusive Matte Gray, a Hyundai first. All 2013 Velosters will be available in colors that fit the cars “own-it” attitude and characteristics of a long-distance runner, including Elite White. Interior color choices are Graphite Black or exclusive to the Turbo Graphite Black with Blue accents and headliner graphics for non-panoramic sunroof models.